Hi guys, it's Lauryn! 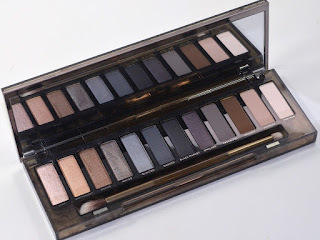 I'm here today to talk about the Urban Decay Naked Smoky Palette! So, I am fully aware that this review is incredibly late however I actually only got this product at Christmas and I still wanted to review it so here we go, I guess. This is the first review that I've done and I'm planning on doing a lot more in the upcoming months so if you're interested please remember to contact me and as usual, the contact information will be at the end of the post! Starting with the packaging itself, the palette outer casing is much more rigid and sturdy than I expected it to be after the not so great packaging that the Naked 2 and 3 palettes had. This strong casing is perfect for me when I'm taking it in my bag as I do not have a fear of it becoming destroyed or for the shadows to crack. Also, the mirror in the palette is big which is great for travelling as it is easy to do your make up in and that is really useful if you don't want to carry a lot of stuff! The eye shadows are absolutely spectacular with a beautiful range of smoky colours that have excellent pigmentation. Another advantage to this palette is that there is just the right amout of glitter shadows to matte shadows to help you create any look at all whether it be a basic day look or an evening out, you can create wonders with this palette. However, I would recommend using a base or a primer to make sure that your look is just as intense as you want it to be. By using a base/primer, you will not need a great deal of product which ensures that the palette will not be used up quickly. I adore every colour in this palette but like any palette, I do have my favourites which I use on a daily basis. My top three favourites in this palette are "Smolder" which is a beautiful dark purple colour which I often use for the outer third of a smoky eye look. Then, there is "High" which is a lovely baby pink colour which is perfect for brightening the inner corners when you've completed your make up look. Finally, another favourite of mine is "Password" which is a matte grey that really will make your look complete. This is a good all over lid colour or it could even possibly be used as a transition shade if you are going for a really intense smoky eye. These are my three favourites but all of the colours in this palette are great. Moving on to the double ended brush that is provided with the palette. This brush is an absolute life saver if you don't wish to take a lot of stuff with you if you are going somewhere as the fluffier end of the brush can be used for blending then the smaller end can be used to really bring out the colours and make your make up look as perfect as ever, I will definitely be investing in more Urban Decay brushes! So, that's the end of my first review! I hope you guys enjoyed reading it just as much as I enjoyed writing it and I'll be here again soon to review some more! If you have any suggestions or queries please feel free to contact me and I hope to see you here again soon! Thank you so much for reading.